Stone veneer siding gives your home a phenomenal aesthetic while protecting it from Mother Nature - all for a good price. If you're looking to give your home's exterior a makeover, siding is a good place to start. Stone siding is gaining in popularity for homeowners seeking a traditional aesthetic that can stand the test of time. You'll be able to rest easy knowing that your siding will last for years to come. The siding professionals at Xterior Solutions are more than equipped to handle all of your stone siding needs. Armed with the industry's best materials from respected manufacturers, we can help you find the best style for your taste and budget. Interested in stone or another kind of stone siding? Schedule a free estimate with Xterior Solutions today! We serve customers in Poughkeepsie, Mahopac, Carmel, and throughout Greater Hudson Valley. Stone siding isn't quite as straightforward as it sounds. Depending on the product and manufacturer, a variety of different kinds of stone can go into this style of siding. Some make use of real stone, including quartzite, sandstone, marble, and many more, harvested from nearby quarries. Others create lightweight faux-stones that look just as attractive as their natural counterparts but are much lighter and, therefore, easier to transport. Yet another option is a stone veneer, again cutting the cost compared to real stone - and Xterior Solutions specializes in this kind of stone siding. Durable. When it comes to longevity, you can't get better than stone. Resistant to fire and storms and impervious to pests and rot, stone siding has been proven to outlast its competitors. Stylish. If you're trying to transform your home's exterior, stone siding can provide unparalleled charm in a variety of colors and other customizable options. Get the aesthetic you've always dreamed of and impress guests and passers-by! Works well with other materials. A potential downside of real stone siding can be its cost, but the good news is that stone can be combined with any other siding materials if you're only looking to accent your home. 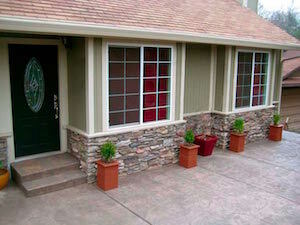 For example, you could install stone siding around entryways or porches. No matter what kind of siding you're considering, Xterior Solutions has the expertise and products necessary for a job well done. Call us at 1-855-252-2535 or contact us online to schedule your free estimate today! We proudly work for customers in Yorktown Heights, Wallkill, Newburgh, Middletown, New Windsor, Hyde Park, Ossining and areas nearby.